We are an open, growing community working on this audatious project. Bodo Hoenen is a social entrepreneur and EdTech innovator working on providing education to the most underserved children. Motivated by his young children's self-directed learning he founded Dev4X and hopes to create a future where every child can learn anything they need, even if they don't have access to formal schooling. "We can solve this challenge, there is no need for millions of children to be lost!" Michael Eydman is a Entrepreneur, Adviser and Innovator, providing business planning, product development and technical solutions. "I strongly believe that everyone should have equal access to education and current lack thereof is the main cause of poverty and world conflicts. I live by a few simple principles: always innovate, provide useful advice, give back and offer gratitude." Matt Kenigson is a serial tech entrepreneur, current CTO of an amazing customized mobile products company with a very fulfilling social mission to improve lives through education. Specialties: Strategic vision and planning, mobile strategy, product development, software development, lifecycle management, team building, mentoring, innovation, customer focus, agile methodology, project management, open collaboration, remote team management. Katie’s passion and talent led her organization More Than Me to win $1MM from CHASE bank recognizing Katie as a leading educator. TIME recognized Katie as an Ebola Fighter and 2014 Person of the Year for leading More Than Me in the fight against Ebola. In September 2013, Katie and Nobel Laureate and Liberian President Ellen Johnson Sirleaf cut the ribbon to the More Than Me Academy – the first tuition-free, all-girls academy in Liberia. Vincent Ogutu, MS, PhD candidate, is an Organizational Behavior scholar who focuses on deeply meaningful work and social entrepreneurship. His experience in education spans his work as the founding MBA Director at Strathmore University and his earlier years as a high school Deputy Principal in Africa. He is actively engaged in promoting social innovation initiatives in several countries, and inspiring people to connect more meaningfully to their lives. James Stanfield works alongside Professor Sugata Mitra at SOLE Central. His research interests include spontaneous orders, self organizing systems and emergent behavior in education. He is also responsible for the management and development of the School in the Cloud web platform. Thibault Sorret is a student at McGill University, in Montreal. He's fascinated by the use of exponential technologies to help improve the field of education and is author of an accelerated learning program. Thierry Karsenti, M.A., M.Ed., Ph.D. holds the Canada Research Chair in Technologies and Education. He is also a Full Professor at the University of Montreal and the director of the CRIFPE (Research Center on Teachers and Teacher Education). He published more than 20 books and 250 scientific articles on the use of technologies in education, on teacher education and on e-learning. Professor Karsenti also worked on a variety of projects in more than 30 countries in Africa. Sunday Ngakama has been working as an Illustrator for NGOs in Tanzania and Finland. He has published comic books, participated in different exhibitions in Tanzania, Finland and Japan and runs grassroots comic workshops for disabled people in Tanzania and for immigrants in Finland. Jeff Bennett is a serial Entrepreneur, Technologist, Strategist and Developer. Founder and CEO of Desktop Anywhere, Director at Logical Method Inc.
Phaedra de Saint-Rome is an undergraduate Honours double major in Political Science and History at McGill University. Phaedra is passionate about sustainable investing, social entrepreneurship, and international development, and has worked at several foundations around the world. Hiroshi E. Shiina - is a business and IT professional with a habit of challenging the status quo. An employee of Google by day, but dedicates much of his free time to supporting DEV4X. "I have finally found a vehicle that can enable millions of children out of poverty." Specialties including strategic management, sales strategy, coaching, mobile marketing, and philanthropy. Anthony DiFlorio is a senior at Seton Hall University. He has a keen focus on the nexus of international development, technology, and education. Chetan Pinto is an Executive Resume Writer and a Linkedin Profile specialist who is very passionate about life-long learning . Besides helping out with the copy-writing and social media requirements of the Dev4X team his interests include leadership development using a process called Appreciative Inquiry. Natalie researches and implements Educational Technology which combines her experience in Play, Technology and Indigenous Education. Through Social Media, she participates in global communities of Mobile Learning, Moodle Learning Management Systems, Gamification Designers, Google Apps For Education and Technology Innovation Groups. Jimm Meloy is a NYC based innovator, learning architect, producer, mentor & non-executive director. His current projects include learning architecture, ed-tech, virtual reality, UN2030 SDG goals, persuasive technologies, 4D design, makers, STEAM, sharing economy, cultural impact & governance and working with early stage startups. Miles Lasater is a serial entrepreneur, Founder, Former President/COO and Board Member of Higher One. Founder and Director of SeeClickFix. Host of Startups 4 Good podcast. Dean Thompson is an accomplished software engineer and experienced entrepreneur. His most recent startup, acquired by LinkedIn, used AI techniques to deliver personalized news content. Dean advises Dev4X on how to bootstrap an organization and gain momentum as a Moonshot team. Avron Barr studied artificial intelligence, cognitive science, and instructional technology at Stanford. He edited 'The Handbook of AI' and co-founded a Silicon Valley start-up, Teknowledge, that was acquired in 1986. Currently he is focused on the rapid evolution of educational technology. Michael Sutton is an Associate Professor at the Bill and Vieve Gore School of Business, Westminster College (WC), in Salt Lake City, UT. His current applied research work focuses on architecting and delivering gamification environments using serious games and simulations. His Career spans across many organizations from Microsoft to various UN Agencies. Andrew Cohen is the Founder/CEO of mobile education startup Brainscape. Cognitive science & metrics geek. Mentor at TechStars. Instructor at General Assembly. Niketan Valapakam is an undergraduate management student at McGill University. He has a keen interest in using strong business acumen in solving large social problems. Amita Krautloher is a University lecturer with a passion for innovation in learning and a keen interest in "liberating" people through education to break the cycle of poverty. She has been a business mentor to SMEs and been involved in many social projects. She applies her skills as a Business strategist and a Project Manager to all her roles. Robert Eckart is currently the managing director of CodeChamps who recently facilitated the design and buildout of a wireless multimedia and internet access system into the Trans Siberian passenger trains. His background includes the design and installation of a unique village wireless education kiosk network for farmers - which was prototyped and installed in 2009 with the guidance of the former royal family in Afghanistan. Eckart will bring his first hand knowledge of field realities to help shorten development time on the Moonshot Project. Millavi Saidi lives in Dar Es Salaam, Tanzania. She graduated from St Marks Highschool in 2010. She assists the Dev4x project as a cultural advisor and translator. Her daughter is part of the prototype testing group of pre-literate learners. Jake Fischer is pursuing an economics degree at the Wharton School of Business. He is passionate about emergent technologies and how they can be utilized to further social development. Tim Young has completed a MSc in Psych, and a PG Cert Educational Psych. His thesis involved extensive research into face-to-face group learning and online group learning. Tim is the founder of the website educationthesedays.com. He has a passion for science and the use of technology to provide educational games that include the resources someone needs to alleviate themselves and their community from poverty. We are a growing group of over 150 amazing volunteers, advisors and supporters, several PhD’s and neuroscientists, numerous educators, technologists and designers, with more joining each week. 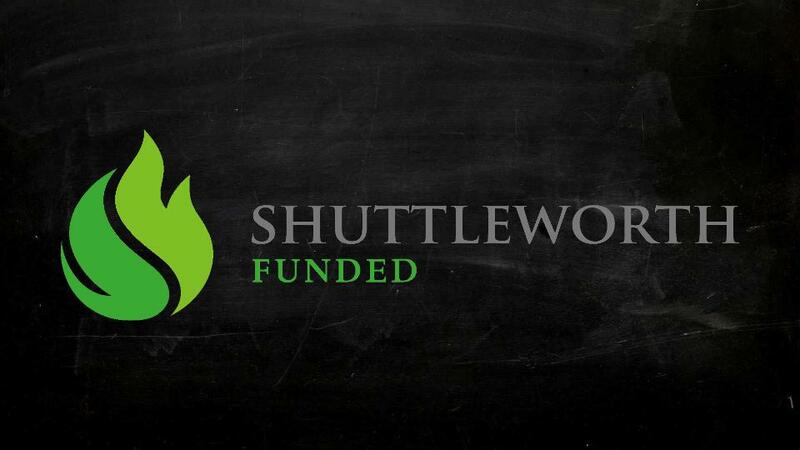 The Shuttleworth Foundation is a social investor that provides funding to dynamic leaders who are at the forefront of social change. Ashoka is the largest network of social entrepreneurs worldwide, putting their system changing ideas into practice on a global scale. The Serval Project - Our Mesh networking and partner. You can read the press release here. Princeton AI - Our Natural Language Processing and AI partner. You can read the press release here. The Global Literacy Project, a consortium of academic and community institutions including MIT & Tufts. The School in the Cloud is helping students prepare for the future through Self-Organised Learning Environments. Google Solve 4 X is a connector, bringing diverse individuals and organizations together to work on moonshots. They are supporting & showcasing our project. The XPRIZE vanguards are a volunteer group of developers, designers, teachers and engineers solving grand challenges.